Yacht Controller significantly reduces the stress and uncertainty involved in tight-quartered vessel maneuvering. Yacht Controller is designed for all boats & yachts. Installed on more than 125 Brands of Boats and growing! If your boat is equipped with electronic controls it can be equipped with a Yacht Controller System. There are more than 8,000 in use on more than 125 brands+ of yachts up to 130 ft in length and more installations every day! Cost depends on several factors including the type of engine controls (CAN BUS or Analog), number of functions you wish to control in addition to the engines, whether you want a Wireless or JCS system or both, and location of your Yacht. 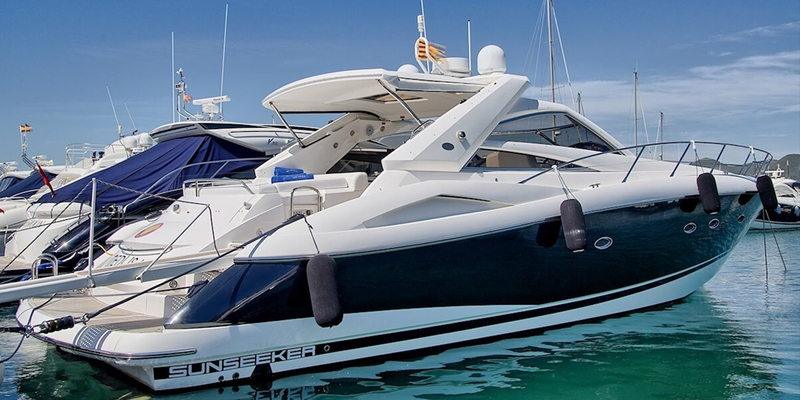 Island Yachts Broker will be pleased to provide you with a personalized quote upon request. YACHT CONTROLLER JOYSTICK "JCS" can be used alone or integrated with our unique and proven Yacht Controller wireless system. With a simple movement of the hand, the Yacht Controller Joystick JCS allows simultaneous operation of the engines and of the bow and stern thrusters, enabling you to maneuver and move your boat in any direction securely, precisely, and simply, with total ease. Yacht Controller JCS is a plug-and-play system convenient to install, without any invasive and costly work in the engine room; and does not require cables to be installed along the length of the boat. Once the type of electronic on-board controls are identified, it is installed quickly in proximity to the control station selected, either on the flybridge or in the salon. On Boats already equipped with a YACHT CONTROLLER system, it can be installed by connecting to the Yacht Controller receiver already on-board. Yacht Controller JCS offers maximum flexibility thanks to its automatic and manual modes. In automatic mode, the motors and the thrusters are used simultaneously to facilitate maneuvers even for those with minimum experience. In manual mode, the thrusters can be activated as required, either together with the motors or separately, for better control of the maneuver you wish to perform with perfect precision and ease. Yacht Controller JCS is equipped with a control panel with LCD screen, visible in sunlight, which has a clear and practical design of the boat with an indication of engines and thrusters, showing you exactly what is activated in the maneuvers being performed. The JCS panel can be used to configure the various operating modes, select language, units of measurement, accurate diagnostics and many other features. With electronic throttle controls equipped with digital protocol, it can be used to manage acceleration, with different settings depending on the percentage of acceleration selected and its run time. The Yacht Controller JCS joystick is all this: another essential aid for managing your boat, developed by Yacht Controller providing "innovative technology for the marine industry". In Island Yachts Broker are exclusive distributors of Yacht Controller on the island of Menorca. Request a quote! We will be happy to meet you!